A former button copy end sign for Interstate 88. Photo taken by Don Hargraves (09/02). Formerly Illinois 5, and before that Illinois 190, the western Interstate 88 is the Ronald Reagan Memorial Highway and the Ronald Reagan Memorial Tollway from Interstate 80 near the Quad Cities east to the Interstate 290 (Eisenhower Expressway) and Interstate 294 (Tri-State Tollway) interchange near Hillside. Until 2004, the tollway section was known as the East-West Tollway (from Sterling east to Hillside). Interstate 88 provides an alternative to Interstate 80 between the Quad Cities area and Chicago (especially points north and west of the Loop). The tollway passes through Dixon, which is the boyhood home of former President Ronald Reagan. Interstate 88 was commissioned in July 2, 1987,1 replacing former Illinois 5. AASHTO previously approved the designation subject to FHWA concurrence on May 25, 1987. The Illinois State Toll Highway Authority indicated that the renumbering was necessary so that they could raise the speed limit to 65 MPH due to a federal law at the time that allowed states to increase speed limits on highways designated as Interstates. The limit was increased between Napierville and Rock Falls.4 A similar process occurred with the unnumbered portion of the Kansas Turnpike, which was designated Interstate 335 to allow for 65 MPH speed limits. The section of Interstate 88 (East-West Tollway) from Interstate 290 (Eisenhower Expressway) west to Aurora was built between 1956 and 1958. The original construction of the 28-mile initial section of the East-West Tollway (and the other original tollways) was funded by a bond issuance in the amount of $415 million by the state tollway commission (which was created in 1953).2,3 All of the urban tollways (including the Northwest Tollway, the easternmost portion of the East-West Tollway, the Tri-State Tollway, and the Chicago Skyway) were open to traffic by 1958. The second major section of the East-West Tollway opened was 69 miles long, from Illinois 56 in Aurora west to Illinois 40 near Sterling and Rock Falls. This portion was funded with a bond issuance by the Illinois State Toll Highway Authority in 1970. This route was shown as under construction in the 1972 Rand McNally Road Atlas and as complete in 1974. The Illinois Department of Transportation built the remainder of the highway from the Illinois 40 interchange west to the Quad Cities in the 1970s; this section has no toll. The first segment of the East-West Tollway (Aurora to Chicago) was originally designated as U.S. 30 Toll. 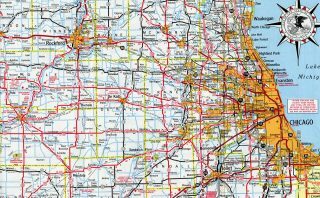 It was changed to Illinois 190 in 1965 and renumbered again to Illinois 5 in 1972 (before the extension to the Quad Cities was completed). 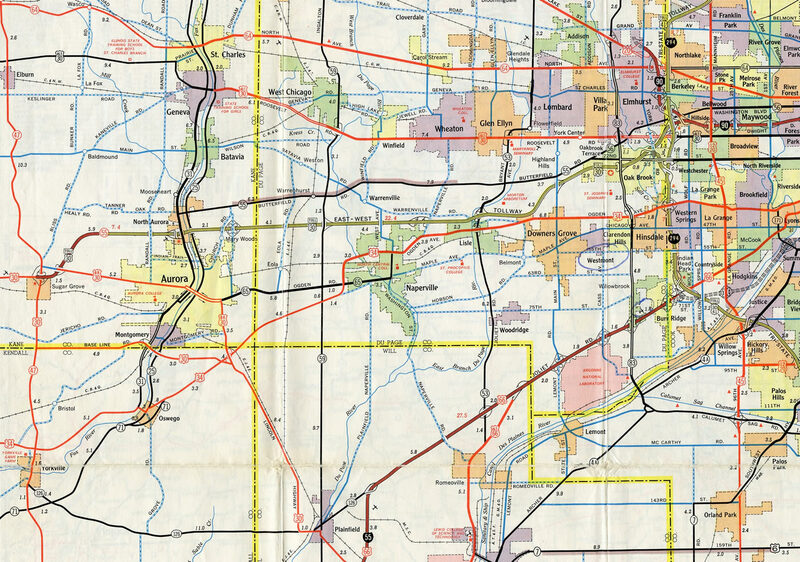 The East-West Tollway ran 29.8 miles from Sugar Grove to Hillside in 1964. The East-West Tollway carried the designation of U.S. 30 Toll until 1965, when it was renumbered to IL 190. The original west end of the tollway to Sugar Grove was eventually designated as Illinois 56. 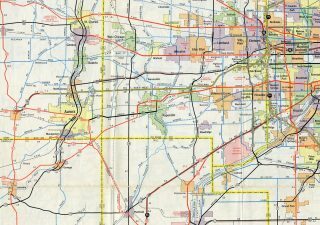 Illinois 5 (East West Tollway) under construction – 1973 Illinois Official Highway Map. Illinois 5 was extended west from Interstate 80 to Rock Island in 1975. The route within the Quad Cities remained after the 1987 commissioning of Interstate 88. Mileage signage before the York Road toll plaza giving distances to the Tri-State Tollway and the Eisenhower Expressway. Photo taken by Brian Dowd (08/16/02). Continuing beyond the York Toll plaza, I-88 & IL 110 approach the ramp for I-294 (Tri-State Tollway) southbound. Photo taken by Don Hargraves (09/02). Traffic headed south on the Tri-State Tollway to I-80 and the Kingery Expressway east to Northwest Indiana departs from I-88 & IL 110 (CKC) east. Photo taken by Brian Dowd (08/16/02). A collector distributor lane takes motorists from Interstate 88 east to both I-290 (Eisenhower Extension) west and I-294 (Tri-State Tollway) north. Photo taken by Brian Dowd (08/16/02). Guide sign on Interstate 88 east for the northbound exit to the Tri-State Tollway toward Milwaukee, Wisconsin. Photo taken by Brian Dowd (08/16/02). Interstate 88 eastbound partitions into a two-lane ramp for I-290 west and I-294 north and the mainline connection with the Inbound Eisenhower Expressway to Chicago. Photo taken by Brian Dowd (08/16/02). Interstate 88 concludes at I-290 (Eisenhower Expressway) east ahead of a c/d roadway for U.S. 12-20-45 and Manheim Road. This portion of the Hillside Strangler interchange was reconstructed in 2001-02. Photo taken by Brian Dowd (08/16/02). Interstate 88 end sign posted at the wye interchange joining the Ronald Reagan East-West Tollway with the Inbound Eisenhower Expressway. Photo taken by Don Hargraves (09/02). The unnumbered ramp for Manheim Road and U.S. 12-20-45 separates as the I-88 mainline joins inbound Interstate 290. Downtown Chicago lies 15 miles to the east. Photo taken by Brian Dowd (08/16/02). The Outbound Eisenhower Expressway advances 1.5 miles from U.S. 12-20-45 / Mannheim Road (Exit 17) to the split with Interstate 88. The forthcoming exchange is commonly known as the Hillside Strangler due to commute hour delays and back-ups. Photo taken by Steve Hanudel (05/14/06). Motorists destined for the Tri-State Tollway separate with I-88 providing the connection to I-294 south. Photo taken by Steve Hanudel (05/14/06). Entering the Hillside Strangler interchange along the I-290 (Eisenhower Expressway). Exit 15A leads to the Ronald Reagan East-West Tollway west to Aurora and the Quad Cities and the Tri-State Tollway south to Joliet and Hammond, Indiana. Photo taken by Steve Hanudel (05/14/06). Interstate 290 branches northwest from I-88 and IL 110 (CKC) along the Eisenhower Extension to Rockford and Exit 15B for the Tri-State Tollway north to O’Hare International Airport (ORD) and Milwaukee. Photo taken by Steve Hanudel (05/14/06). Continuing through the Hillside Strangler interchange, I-88 & IL 110 first meet the off-ramp for I-294 (Tri-State Tollway) south and IL 38 (Roosevelt Road). Photo taken by Steve Hanudel (05/14/07). Two lanes depart for the unnumbered exit linking I-88 & IL 110 (CKC) west with I-294 south and IL 38 (Roosevelt Road). Photo taken by Steve Hanudel (05/14/06). The first confirming marker for Interstate 88 west appears after traffic from Interstate 294 merges onto the East-West Tollway. Photo taken by Steve Hanudel (05/14/06). Interstate 294 (Tri-State Tollway) northbound at U.S. 34 (Ogden Avenue), two miles from the connector to Interstate 88 west. The control point is the far western suburb of Aurora, 21 miles out. U.S. 34 see its eastern terminus a short distance to the east. Photo taken 09/03/05. One mile ahead of Ronald Reagan East-West Tollway on Interstate 294 north. Interstate 88 also serves De Kalb and the Quad Cities. Photo taken 09/03/05. An additional northbound lane opens along I-294 for I-88 & IL 110 (Chicago Kansas City Expressway). Photo taken by Don Hargraves (09/02). Two lanes leave the Tri-State Tollway north for Interstate 88 & IL 110 west. Succeeding ramps connect with IL 38 (Roosevelt Road) and I-290 (Eisenhower Extension). Photo taken by Don Hargraves (09/02). Southbound Interstate 294 meets I-290 (Eisenhower Extension) west, with the two freeways running side by side to the Hillside Strangler interchange with I-88 in 1.75 miles. Photo taken 09/03/05. Interstate 290 angles southeast from the Tri-State Tollway toward the Inbound Eisenhower Expressway. I-88 combines with the freeway at the east end of the Hillside Strangler interchange. Photo taken by Don Hargraves (09/02). Motorists bound for Downtown Chicago part ways with the Tri-State Tollway south. The westbound ramp for I-88 (Ronald Reagan East-West Tollway) follows in 0.75 miles. Photo taken by Don Hargraves (09/02). I-294 south at I-88 west to Aurora and Moline. The northern fork of Interstate 88 originates from I-290 (Eisenhower Expressway) just to the east, while the southern fork ties into Interstate 294 south beyond the Cermak Road interchange. Photo taken by Don Hargraves (09/02). Interstate 88-Illinois 92 & 110 (Chicago Kansas City Expressway) west parallel Zuma Creek across an agricultural area on the two mile approach to Exits 1B/A with Interstate 80. Photo taken 09/04/05. The on-ramp from Former IL 2 merges with the c/d roadway (Exit 1B) ahead of the ramp for Interstate 80 west to Le Claire, Bettendorf and Des Moines, Iowa. Photo taken 09/04/05. Interstate 88 ends as Illinois 5 begins just west of I-80. IL 5 joins IL 92 along an at-grade expressway southwest to Silvis. Photo taken 09/04/05. See Interstate 88 West – Sterling to Quad Cities for additional photos from this perspective. All remaining signs for Exits 1B/A were replaced with Clearview font based panels by 2013. See I-88 Illinois Archive on AARoads for photos. Guide signs for the full cloverleaf interchange joining Interstates 80 and 88 appear along the Illinois 5 & 92 expressway leading east from Hubbard Road north and 193rd Street North. Photo taken 09/04/05. Illinois 5 ends as Interstate 88 begins. The drive east to Aurora is generally rural. Photo taken 09/04/05. Illinois 5 & 92 intersect Hubbard Road north and 193rd Street N to become a freeway. The full cloverleaf interchange (Exits 1A/B) with Interstate 80 lies a half mile ahead. Photo taken 03/12/17. Additional photos of the eastbound beginning of Interstate 88 posted at Interstate 88 East on AARoads. I-88 & IL 92-110 (CKC) quickly enter a diamond interchange (Exit 2) with Old IL 2 to the immediate east of Interstate 80. IL 2 remains in service northeast of Dixon along the Rock River. Photo taken 03/12/17. The first confirming marker for I-88 stands along the rural stretch leading from East Moline to Joslin. Photo taken 03/12/17. Signs posted at Exits 1A/B for Interstate 80 were replaced with Clearview font by 2013. I-80 east combines with IL 110 (CKC) south to Interstate 74 at Colona. Photo taken 09/04/05. A loop ramp (Exit 1B) follows onto Interstate 80 as it leads north to Rapids City and Le Claire, Iowa. The freeway runs across northern reaches of Bettendorf and Davenport en route to Iowa City. Photo taken 09/04/05. The Mississippi Rapids rest area and welcome center lies two miles north of the exchange joining Interstate 80 east with I-88 east, IL 5 west and IL 92. Photo taken 03/12/17. One mile north of Exits 4A/B with I-88 and IL 5, IL 92 and IL 110 (CKC). IL 92 is part of a multi-state route beginning in Torrington, Wyoming and ending at U.S. 34 near La Moille, Illinois. 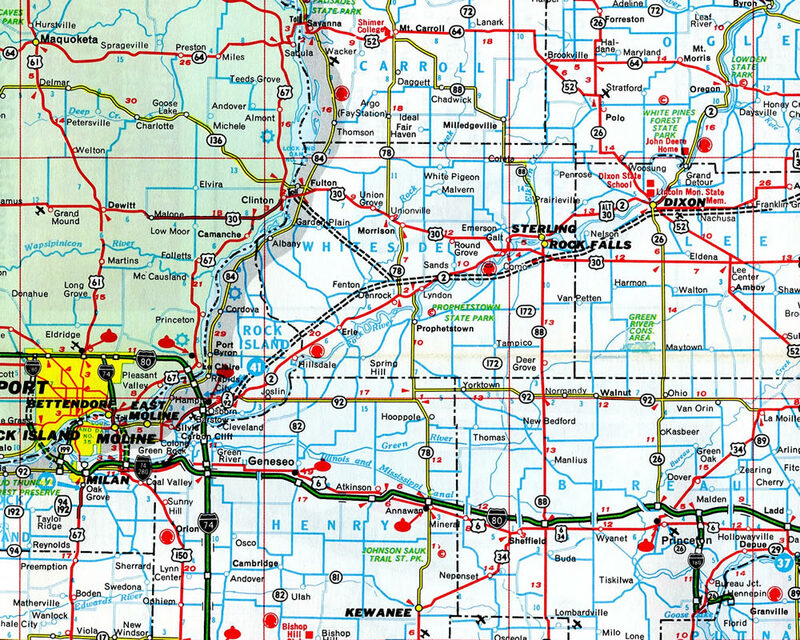 IL 5 west encircles southern reaches of Moline and Rock Island from East Moline to U.S. 67. Photo taken 05/28/18. The initial 44 miles of Interstate 88 east is the toll free Ronald Reagan Memorial Highway. Beyond U.S. 30 (Exit 44), I-88 follows the Ronald Reagan East-West Tollway past Rochelle (I-39/U.S. 51), De Kalb, Aurora and Naperville before ending at the merge with I-290 just outside Chicago. Photo taken 03/12/17. Eastbound Interstate 80 reaches Exit 4A to Illinois 5-92 west to Silvis, East Moline and Moline. The succeeding ramp (Exit 4B) connects to Interstate 88 & Illinois 110 (Chicago Kansas City Expressway) east to Sterling and Rock Falls. Photo taken 05/28/18. Interstate 88 begins where IL 5 ends below I-80 at Exit 4B. IL 92 combines with the freeway east to Joslin (Exit 6). IL 110 (CKC) overlays all of the route to I-290. Photo taken 05/28/18. Photos showing older guide signs for Interstate 88 (Exit 4) on I-80 east are posted at I-80 Illinois Archive – East on AARoads. Approaching the Rock River and the Rock Island County line, drivers on Interstate 80 west & Illinois 110 (CKC) east see the first sign for the interchange with I-88 and Illinois 5 & 92. Photo taken 03/31/16. Advancing north across Barstow Road, one mile south of the cloverleaf interchange (Exits 4A/B) with I-88, IL 5 west and IL 92. Illinois 5 west remains from I-88 as a 15-mile route serving Silvis, East Moline, Moline and Rock Island. Photo taken 03/31/16. Interstate 80 and IL 110 (CKC) separate in one mile at Exits 4A for I-88 & IL 92 east to Sterling and Rock Falls. 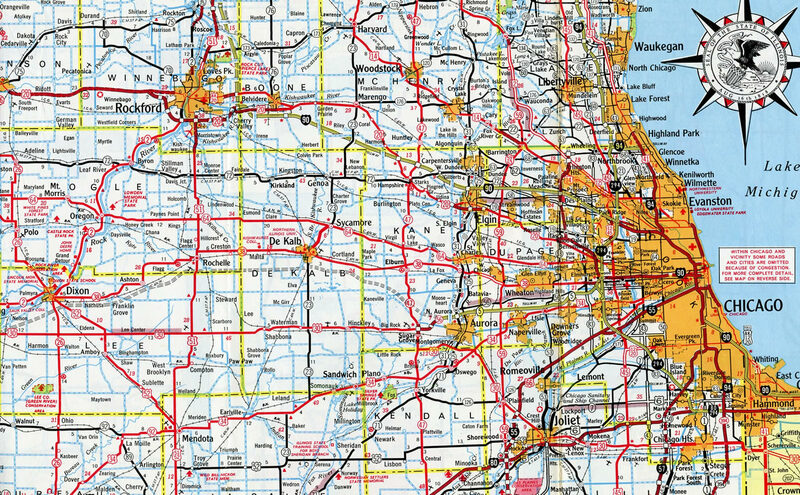 The Chicago-Kansas City Expressway overlays all of Interstate 88 to I-290. Photo taken 03/31/16. I-80 west & IL 110 (CKC) east reach Exit 4A for Interstate 88 and Illinois 92 east to Sterling and Rock Falls. I-88 continues east onto the East-West Tollway, which serves Rochelle, De Kalb, Aurora, and Naperville before ending at Interstate 290 (the Hillside Strangler interchange). The following ramp (Exit 4B) connects to Illinois 5 & 92 west to Silvis and East Moline. Photo taken 03/31/16. See Interstate 80 West – Illinois Archive on AARoads for historical photos showing replaced guide signs for the junction of I-80 west at I-88. Personal Email from Jason Hancock on 07/09/06, citing an article from the Moline Daily Dispatch on 7/29/87. “East-West Tollway now I- 88 – speed 65 in one area.” Chicago Sun-Times, July 2, 1987. “Motor Club To Hear Study On Tollway.” Chicago Tribune, September 26, 1963. Page updated June 4, 2018.